The publication Futurism reported April 13 that PepsiCo's Russian subsidiary was working with a startup there called StartRocket to advertise an energy drink called "Adrenaline Rush" using satellites. The company has proposed flying a set of small satellites in formation, reflecting sunlight with Mylar sails to create logos or other advertising messages visible from the ground after sunset and before sunrise. In one illustration on StartRocket's website, a logo of a fictional soft drink company, "LocaCola," is visible in the night sky over a city. "Space has to be beautiful. With the best brands our sky will amaze us every night," the website states. Olga Mangova, a spokesperson for PepsiCo Russia, told Futurism that the company had agreed to partner with StartRocket on an orbital advertising campaign. "Orbital billboards are the revolution on the market of communications," she said. However, PepsiCo's headquarters in the United States has shot down the idea. "We can confirm StartRocket performed an exploratory test for stratosphere advertisements using the Adrenaline GameChangers logo," a company spokesperson told SpaceNews April 15. "This was a one-time event; we have no further plans to test or commercially use this technology at this time." The company didn't elaborate on the "exploratory test for stratosphere advertisements," but it appears to refer to a high-altitude balloon test of the technology that StartRocket says on its website it planned to carry out in April in cooperation with Russia's Skolkovo Institute of Science and Technology, or Skoltech. StartRocket was founded a year ago, and has yet to deploy any satellites in orbit. It's unclear if the startup has both the funding and technology needed to deploy a group of formation-flying cubesats needed to carry out its business plan. The company says it’s working to raise a $25 million funding round. Federal law in the United States restricts the ability of companies to perform such advertising. A provision of law covering commercial space transportation prohibits the Secretary of Transportation from approving launch licenses for payloads that are for the purpose of "obtrusive space advertising," which is defined as "advertising in outer space that is capable of being recognized by a human being on the surface of the Earth without the aid of a telescope or other technological device." The law does not prohibit other forms of advertising, including placing logos on the sides of launch vehicles or spacecraft. 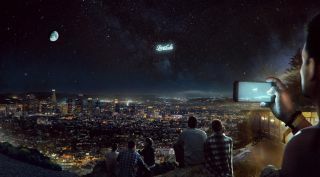 The idea of advertising from space, or even satellites whose primary purpose is to be seen in the night sky, has attracted controversy. That included the 2018 launch of Humanity Star, a secondary payload on a Rocket Lab Electron rocket that was designed by that company to be "a bright symbol and reminder to all on Earth about our fragile place in the universe." Some astronomers likened the satellite to vandalism of the night sky, although the satellite was in orbit for only a couple months and was fainter than expected.